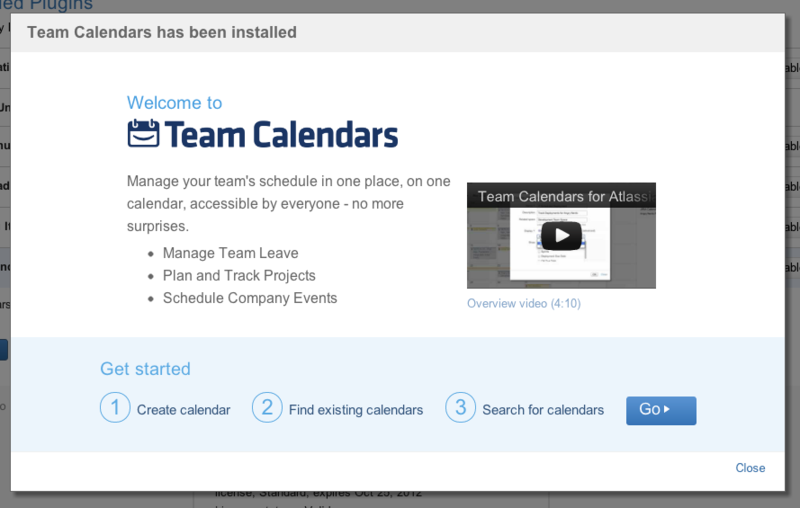 The Atlassian Team Calendars team is pleased to announce the release of Team Calendars 2.5. This release was mostly focused on improving the the initial experience for creating and embedding calendars for admins and first-time users. So it's all find-and-dandy that admins know the plugin is installed, but what about your end-users? We've been thinking of how we can make it easier for admins to communicate to end-users that new functionality is available. To improve this experience, we made use of the WorkBox notification API to notify all end-users once an admin has licensed Team Calendars on their server. In addition, we've also improved the editor property panel states so we have the "selected" state persisted when you toggle different views in the editor property panel. So we've shown you how it's now easier to discover that Team Calendars is installed in your server, reduced the friction for creating a calendar and improved the visual experience once you've embedded a calendar on a page. 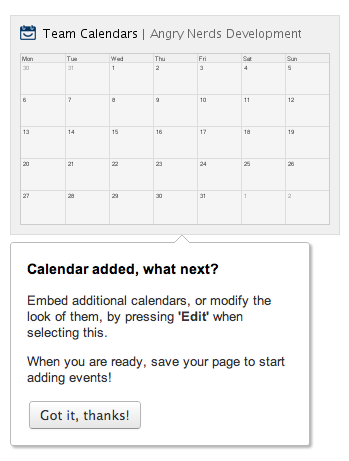 We've got a bit further with this experience for first-time users: If this is the first time you're embedding a calendar on a page we now provide a guided tip to help you work out "what next?". From here, users are informed they can continue to modify the macro and save the page to start creating events. 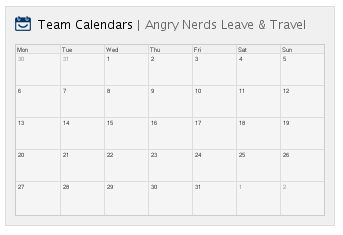 We've implemented a high-voted feature: the ability to show the calendar legend in the editor. 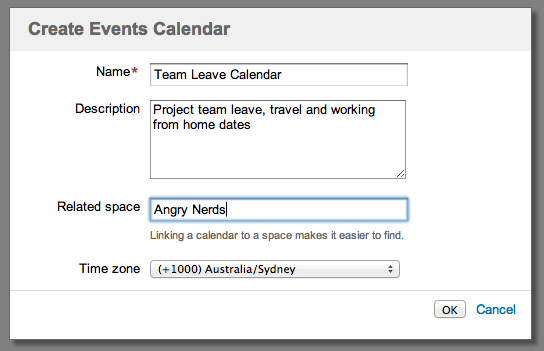 This is helpful if you want to embed multiple calendars at once like your JIRA project calendar alongside your team leave and travel. In month and week view, we now show the event description or people calendars so users don't have to click on the event to get that information. 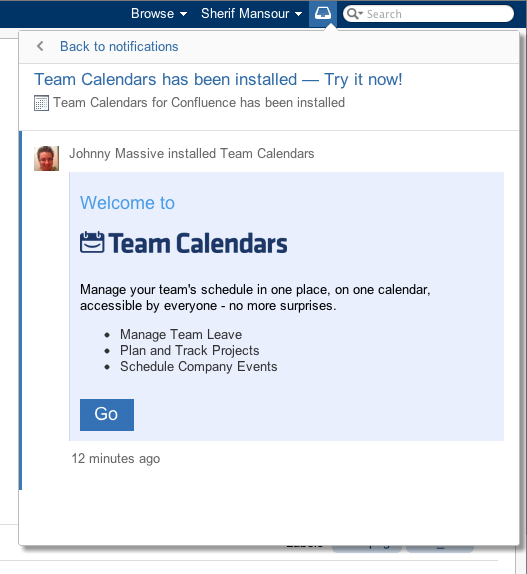 WorkBox notifications for Team Calendars requires Confluence 4.3 or higher. The post-install dialog for admins requires UPM 2.7 or higher. Alternatively, download the latest release from our plugin exchange and install it via the Plugin Administration screen. 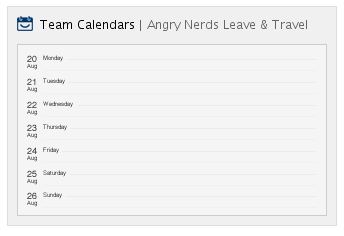 This should upgrade Team Calendars to the latest version.